The Music Collection at Sinclair Library is the largest music collection in the State of Hawaiʻi. The main function of the collection is to support the teaching and research efforts of students and faculty from the UH Music Department. 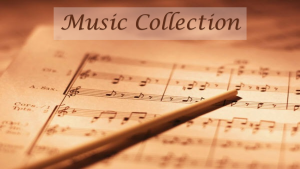 The music collection contains music scores, books about music, music dictionaries and other reference tools, and music-related CD-ROM databases. Recordings of music are available in the Wong Audiovisual Center. The collection is diverse and offers a wealth of material in the areas of music education, theory, esthetics, popular music, jazz, guitar repertoire, musical comedy, and history, which western classical music from the Middle Ages to the present, ethnomusicological, and Hawaiian materials. There are physical and digital repositories of Hawaiian music. Ultimately, the musicians who are the true living repositories of Hawaiʻi‘s rich musical traditions. UH Mānoa student, faculty, or staff have access to thousands of tracks of free streaming music through our subscription services. The Rekion collection of historical audio recordings from the National Diet Library of Japan. There are over 50,000 streaming sound recordings from Japan, including music, speeches, and performing arts. Access from the Rekion computer in the Wong Audiovisual Center. Recordings are not downloadable.